For many centuries now the Japanese have used a combination of cotton futon laid out on tatami as bedding. Indeed many of our customers contact us because they have slept in a Japanese Inn and have had such a good night’s sleep they would like to enjoy the same experience in the UK. One other great advantage of this system is that the futon are so light that they can be folded and stored each night meaning a room can double as a bedroom and also as a living room. We now offer a combination of tatami and futon which can be supplied either with or without a frame. 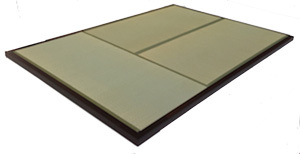 Authentic tatami are 55-60mm thick and so this makes a step up for the platform.